If you’re doing it right, teaching undergraduates is incredibly difficult. Delving into the scholarship of teaching and learning can be absolutely overwhelming, especially if the principles of Vision & Change are new to you. Preparing excellent activities, making sure that students are engaged, redesigning a course so that it’s “flipped”- all of these things take a great deal of time and effort. But the research shows it’s well worth it. It may be easier for instructors to develop passive lectures and slideshows, but many agencies and institutions are united in calling for drastic changes in pedagogy that include more active learning approaches (dip into some of the literature using the PULSE V&C Toolkit). One effective strategy is to use peer-reviewed literature to introduce students to core concepts in biology (for one excellent example, check out Sally Hoskins’ C.R.E.A.T.E. method). It is possible to design an entire course around a set of four to five primary research papers, achieving your learning objectives while successfully engaging students in the process of science. There’s a hitch: reading primary literature is difficult. Even seasoned peer-reviewers can struggle with the density and jargon. Undergraduates find reading their first research paper even more intimidating; it is a “trial by fire” not only because they have no experience with the conventions of the genre, but because they are wading into uncharted conceptual territory. I remember teaching my Genome Science class at North Carolina State University how to read a research paper. I suggested they start with the abstract, then try to get a general idea of what the figures were showing them. The next step was to move onto the intro, re-examine the figures, and read the discussion. Once they’d made it that far, then they would look over the methods and results. Even with guidance, becoming a seasoned reader takes practice. What if there was a way to ease new readers into a peer-reviewed paper? Those questions were raised at a GSA Education Committee meeting by the Chair at the time, Beth De Stasio (Lawrence University), and later seconded by Scott Hawley (former President of GSA, Stowers Institute) and Mark Johnston (Editor-in-Chief, GENETICS; University of Colorado School of Medicine). In 2012, GENETICS unveiled its answer in a new type of article: the Primer. Primers in GENETICS now come in two flavors: Research Primers, and Model Organism Primers. Research Primers accompany peer-reviewed research articles published in GENETICS, and serve as a tool to guide the reader through the paper. Research Primers provide an expanded introduction and background, highlighting why the research was conducted and how the authors decided to address their unanswered questions. Methods used in the original article are presented with helpful context, typically also accompanied by explanatory graphics (see the description of yeast two-hybrid, for example, or knockout methods). Results are described in detail: what did the researchers find? How did they analyze their results? How were the results interpreted? An expanded discussion is followed by a guide for educators, which often includes a set of questions for classroom use. What I would have given to have such a tool in my class! I am positive that my former students echo that sentiment. Model Organism Primers provide a thorough background of a model genetic system, covering everything from its life cycle to the available genetic and genomic tools. Currently, Primers are available for budding yeast (Saccharomyces cerevisiae), fission yeast (Schizosaccharomyces pombe), nematode worms (Caenorhabditis elegans), and the fruit fly (Drosophila melanogaster). Each of the Model Organism Primers was crafted by teams from their respective model organism communities. Not only are they incredibly useful, they also read as a kind of love letter to these systems. Indulge me a moment as I reflect on my personal favorite–the fly Primer. Yes, I chose to work with D. melanogaster because of its ease of use, its complex behavior, and its fully sequenced genome (a huge deal when I started grad school); but along the way, I got attached to the little critters, so reading about everything that makes flies great warmed my heart. I daydreamed for a moment that we had the fly Primer in my graduate advisor’s lab–we worked extensively with undergraduates, and if we had been able to hand them this paper, it would have made things so much easier for both them and us. And not just undergraduates! This Primer would have been a lifesaver for me when I started grad school as a fly-pushing novice. Model Organism Primers also serve as excellent introductory tools for the classroom. For instance, imagine wanting to introduce your students to the concepts of gene function and expression, or specifically RNAi and genetic screening. Ideally, you could do this using a paper in GENETICS like “A Network of Genes Antagonistic to the LIN-35 Retinoblastoma Protein of Caenorhabditis elegans” by Polley and Fay (2012). Unless you’re leading a very advanced class, though, you’d first want to give them background on C. elegans: assign “A Transparent Window into Biology: A Primer on Caenorhabditis elegans” by Corsi, Wightman, and Chalfie (2015) as a pre-class reading, then have a discussion about the importance of model systems in your class. Next up, pair Polley and Fay’s paper with its corresponding Research Primer, “Suppressors, Screens, and Genes…” (2012) authored by Beth De Stasio. As she says in the abstract, “An article by Polley and Fay in this issue of GENETICS provides an excellent opportunity to introduce or reinforce concepts of reverse genetics and RNA interference, suppressor screens, synthetic phenotypes, and phenocopy. Necessary background, explanations of these concepts, and a sample approach to classroom use of the original article, including discussion questions, are provided.” Not only will your students learn core concepts in genetics, but they will gain a firmer grasp on a genetic model system and on how to read primary literature, both important core competencies in our field. We hope that Primers in GENETICS will help you in a plethora of different ways, whether it be fine-tuning your teaching, or introducing a new student into your lab. Interested in becoming a Primer author? 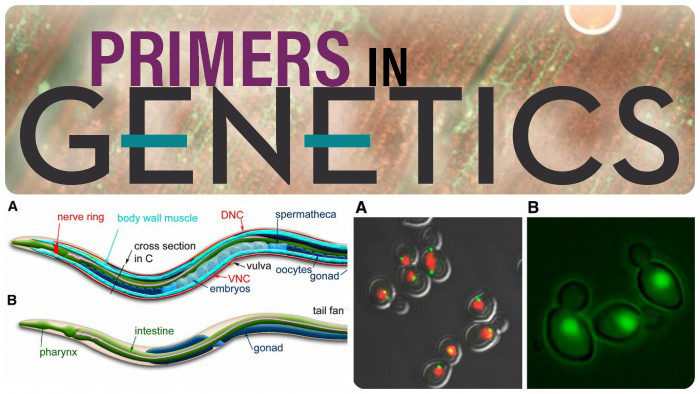 Contact GENETICS Primer Editor Beth De Stasio for more details. Keep an eye out for more Primers coming out soon!